Truth be told, I hadn’t really been interested in picking up any more of John Green’s books since I read Looking for Alaska. 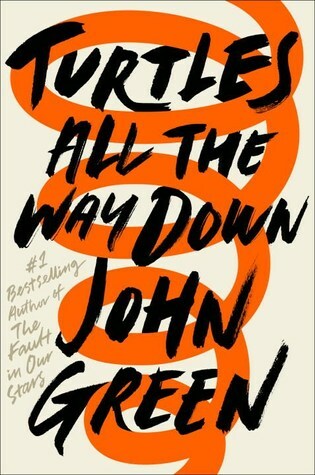 I just didn’t necessarily care for that book or the style of it so I had just assumed I was finally “over” John Green. I didn’t plan on even buying this book but in all actuality, I am glad that I did. Well, I’ll tell you right here first: I’m obviously not over him. And I am so happy that I continued to read what he put out because Turtles All the Way Down was so incredible. “That’s what life is like?” I was trying to get his meaning. I am Aza. I have so much of Aza inside of me and I seen so much of myself inside of her. BUT, by saying that, I have a Daisy and a Davis. I have those understanding, patient, and protective friends/husband in my life. And John Green nailed that. Honestly, he did. We all need those type of friends. No matter how much you want to be alone and no matter how much you get lost, we all need to have those friends to help keep us grounded and where we need to be. The writing in this book was way above par for me and what I’m usually used to getting from John. It was much more readable to me and the use of metaphors all throughout the book was in-genius. Especially when I am a huge love of books that contain USEFUL and realistic metaphors. Aza’s mother. I think she was my favorite. Her involvement and constant protectiveness over Aza is just what kids need and as a parent that is what we should be doing for our children. Asking how Aza is feeling, asking about her life, if she’s feeling anxious. Children need to be heard. Even us, as adults, need to be heard. And Aza’s mother takes the time to let her daughter be heard. Every child should have that. Every PERSON should have that. All in all, Aza’s character seemed very realistic to me, yes, but so did the others in the book. The character dynamics and growth felt personal and to me I just really enjoyed that. I think everyone will relate to Turtles All the Way Down on some sort of level because the story grapples with the types of realizations we all face while growing up and even what some of us grapple with as adults. So to read a book, and not feel alone, is an overwhelming and wonderful feeling.